FORT SMITH, Ark. — Just when we thought we had seen it all, we would turn a corner and find something else to admire or to teach us about our country’s history. Carla, my wife and fellow history buff, and I had stopped at the Fort Smith Museum of History in Arkansas, another of those museums resembling a giant attic with tools, weapons and household items from each major period of the city’s history. A collection of early tools was especially good. The exhibits cover western Arkansas history from the early American Indian settlements to the present. Besides the American Indian stone tools and weapons, there is a small statue from the Mayan culture that must have come to this area through trading. American Indians were well-established in the area, and the exhibits pay attention to the problems of removing them from what they saw as their home territory. The white settlers called it “voluntary” removal. The whole process was complicated by the flood of American Indians from the southeastern United States. The tribes involved were Cherokee, Choctaw, Creek, Chickasaw and Seminole. Brought into western Arkansas over the Trail of Tears in 1820, these tribes were then pushed into what is now Oklahoma. Initially Fort Smith served as a supply depot for American Indians, but in 1824 the Army moved out and trading posts and farmers moved in. The soil was rich — “too rich for Indians” in some people’s minds. The area also became a center for illegal whiskey peddling. Because of jurisdictional problems, lawbreakers went into Indian Territory, where they would be beyond the reach of U.S. and state courts. To help solve the problems caused by this outlaw territory, a federal court was established at Fort Smith in 1871, presided over by Judge Isaac Parker, the “hanging judge.” This museum has his original courtroom furniture. The Fort Smith National Historic Site, just down the street, houses the original room where the court was held and has copies of the furniture. During the Civil War, western Arkansas was under Union control, but despite this protection, the area was devastated. Small displays feature Civil War artifacts. 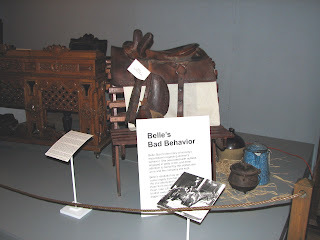 Belle Starr’s sidesaddle also is prominently displayed. Most stories about her are exaggerations or are untrue. She came from a good family and was well-educated, having studied Greek, Latin, music and etiquette. She successfully raised, sold and bred horses. Her main offense was fencing stolen horses for some of her outlaw friends. She was found guilty of horse stealing and sent to prison in Detroit, where she was murdered at the age of 41. Her killer was never found. Her daughter, Pearl, later became a Fort Smith madam. Furniture, clothes and other artifacts are on display from the Victorian era and from World War I and World War II. The community is proud of William O. Darby, who started the Army Rangers in World War II as a companion group to the British commandos. One room displays pictures, uniforms, weapons and news stories from his life. He was wounded three times, decorated 10 times and was eventually killed in Italy a day before all Germans in Italy surrendered. At the time, papers promoting him to the rank of brigadier general were being processed. We tried to take the walking tour of the refurbished houses in the Fort Smith Old District, but neither of us is enthusiastic about older houses unless they have a ghost story or someone around to tell us about the people who once lived there. So we moved to our next stop, Van Buren, which had received good notices in the local literature. It is noted for its train excursions in the Ozark Mountains. The trains run from April through September, but because we were there in February, we didn’t get a chance to experience it.